Benjamin Netanyahu the finance minister would find a lot not to like about Israel’s economy these days. Now headed for a fifth stint as prime minister, Netanyahu -- who began his path back to power as finance chief from 2003 to 2005 -- will have to contend with a widening budget deficit and criticism of interventionist policies that call into question his reputation as a stalwart of capitalism and fiscal discipline. The nation’s debt burden is rising for the first time since Netanyahu, popularly known as Bibi, began his second term in 2009 and Israel is ranked behind Kosovo and Moldova in the World Bank’s latest Doing Business report. Some of the damage was self-inflicted, rooted in the political horse-trading of Netanyahu’s last two terms as prime minister, when cabinet portfolios turned into bargaining chips to cobble together governments with other parties. The current finance minister, Moshe Kahlon, has overseen an uptick in spending that helped lead to the widening deficit. His Kulanu party gained four seats in last week’s elections, giving him a chance of retaining his job. For Netanyahu to address the challenges now facing Israel’s public finances, he’d have to navigate between two politically unsavory options: go against his stated preference for tax cuts or avoid giving his religious allies the money they typically demand for their support. 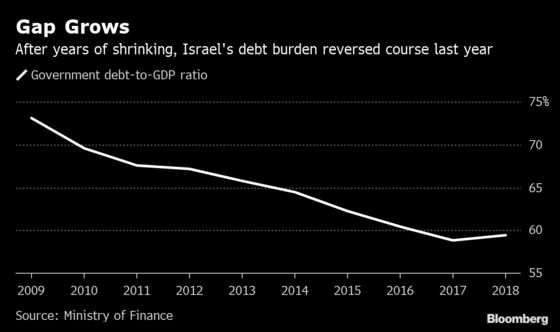 Israel’s central bank has warned the government needs to make fiscal adjustments, but slowing economic growth and a strong electoral performance by ultra-orthodox parties -- who typically seek big budgets for their constituents -- will complicate those efforts. “The economy is weakening and the deficit is high, and the coalition negotiation could be expensive, so it’s not a simple situation,” said Alex Zabezhinsky, chief economist for Meitav Dash Investments Ltd. Educated at MIT and an alumnus of Boston Consulting Group, Netanyahu used his early years in power to upend what he called Israel’s “paleo-socialists” by embarking on a campaign to privatize holdings, remove restraints on the currency and slash debt. Netanyahu lowered taxes and took steps to boost competition as the economy started booming. Under his stewardship, the country’s ratio of debt to gross domestic product entered a period of near-steady declines. He oversaw a 75 percent rise in GDP since he returned to office in 2009 and now presides over a country whose tech scene is thriving as it forges stronger trade ties around the world. Israel’s sovereign credit ratings climbed. But Netanyahu also raised child allowances that had previously been cut, sought to increase defense spending, and appointed a director-general of the Communications Ministry who departed from reforms that boosted competition. Last year, tax cuts, spending on housing and disability benefits, and a lack of one-off revenue windfalls contributed to a widening deficit. The Ministry of Finance has forecast the 2019 shortfall at 3.5 percent of GDP, above the 2.9 percent target. Kahlon has also pursued a housing subsidy program panned by some economists for distorting the market. A spokesman for Kahlon said the debt and deficit should be managed “in a professional and responsible way” as they have been during his tenure, and that the finance minister is in favor of free markets. Israel’s current debt ratio is below most peers. But the Bank of Israel concluded in its 2018 annual report that economic expansion slowed by about 0.8 percentage point since the start of the decade, compared with the previous 10 years. Previously it’s warned that the country is at risk of losing its competitive edge as productivity trail other developed nations. 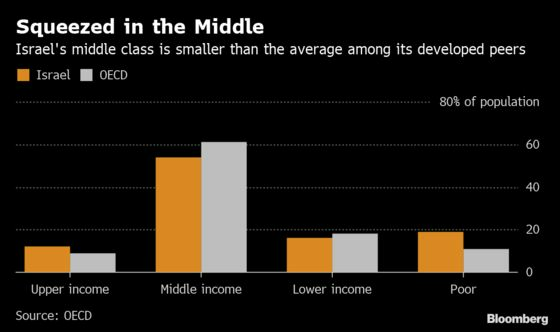 Meanwhile, the size of Israel’s middle class lags behind levels for developed economies while the proportions of the upper class and the poor are higher than average. Israel also desperately needs infrastructure investment and its health care system is strained. With the International Monetary Fund lowering this year’s growth outlook, the next finance minister faces a tall order.